Police have arrested a serial burglar after thefts at universities throughout the country over the last five years. Emm, 32, was arrested at a Nakorn Pathom hotel on Saturday. Sanook reported that she had stolen from universities in the north, south, east and west of the country. The latest cases involved thefts at Chiang Mai universities – Rajabhut University, Mae Jo and Chiang Mai University – in March. She netted over 200,000 from offices including 194,400 baht from Rajabhut where she was taken on a reenactment yesterday. She had been caught on CCTV at that theft. Other cases in the north happened at universities in Chiang Rai, Phayao and Lampang. The suspect has told police that universities provided easy pickings. She could mingle with the public to case the joints in the daytime before returning at night to steal. She claimed the money was to pay for her six month old child and husband who is out of work. But it was also mentioned that she was addicted to playing and gambling on the stock market. 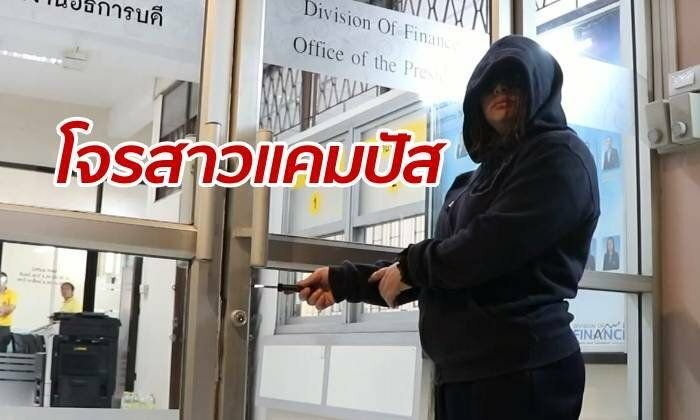 Pol Maj Phichet Jiranantasin of the Chiang Mai police said that the suspect had been stealing from universities all over the country in the last five years. She even conducted one theft when when was eight months pregnant with her child. The latest theft was just last week at a uni in Nakorn Pathom. She has been charged with theft from government facilities during the hours of darkness. Tourist thieves set to net a little over 300 baht each!